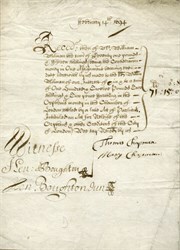 Handwritten Receipt and Assignement for Orphan Monies to the Chamber of London signed by Thomas and Mary Chapman on behalf of William Wilman dated 14 Feb 1694. This item is over 321 years old. The financial crisis in the City at this period led to a number of initiatives and funds being formed - this being one. The matter was not resolved until the founding of the Bank of England later in 1694. The London Orphans� Debt was the substantial debt of money which was owed by the Corporation of the City of London to widows and orphans of freemen for whom legacies had been deposited in the City�s treasury. Over the course of the seventeenth century these funds had been frequently raided to meet persistent shortfalls in the City�s income, so that by the early 1690s some two-thirds of the City�s overall debt of �747,000 was owed to the Orphans. Much of the debt had accumulated over many decades due to the practice of paying a rate of 4 or 5 per cent on deposits. Such a favourable option had had the effect of increasing the deposits being made. Unfortunately, the worsening state of the City�s finances had made it necessary for the rising expenditure on interest payments to be met from the Orphans� trust money. By the 1680s credit was drying up, and the Orphans � who apart from genuine legatees, included speculators who had bought into the debt at discount � began to clamour for relief and turned to parliament for assistance. In 1685, a government bill to resolve the crisis failed due to prorogation. In the early 1690s further bills were attempted, both in the Lords and the Commons, but these, too, failed through loss of time. 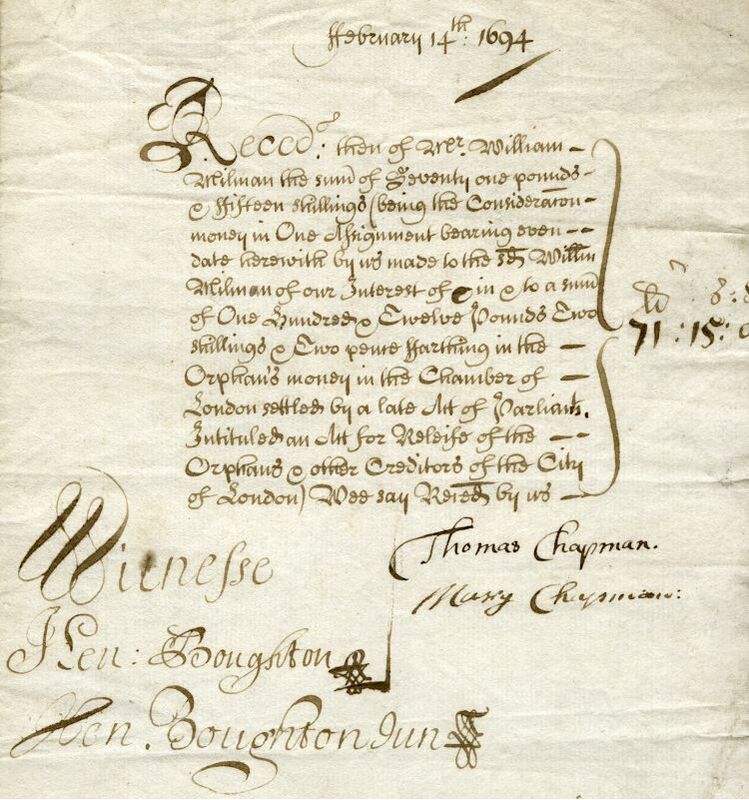 The bill introduced in the Commons in 1693, initiated by petition from the Corporation, sought to limit the administration of its finances up to a yearly maximum of �10,000 for its running costs, while all surplus monies were to be appropriated for repayment of the debts. The issue had developed into a minor party battle with the Whigs supporting the City and opposed to such a harsh solution, and the Tories defending the interests of the Orphans. Deadlock was reached at the bill�s committee stage in March 1693. A new bill was introduced in February 1694, the terms of which were more lenient towards the City, and this time reached the statute book. The establishment of a fund to which the City was required to commit around �30,000 a year from its various revenues enabled annual interest payments of four per cent to be paid to the Orphans, and provided an outcome which greatly satisfied the City insofar as it was spared from having to sell off large tracts of prime property. The new Act did not, however, make provision for repayment of the principal debt. In March 1695, the Speaker of the House, Sir John Trevor was forced to resign and was expelled from the House after it came to light that he had accepted 1,000 guineas from the City for helping to ease the Act�s passage. John Hungerford, who had chaired the committee of the whole House on the bill, was found to have accepted 20 guineas and was also expelled. Paul Jodrell, the clerk of the House, had accepted 200 guineas but was retained in his post.